The Rosenegert is a ‘lieu-dit’ located on the Kirchberg hill but not in the Grand Cru area. This unique wine is a field blend. Thus, when we have planted the first vines in 1998, we decided to blend five different varieties together in the same soil. This way of making was very common in the early 1900’s in Alsace. The Rosenegert is a ‘lieu-dit’ located on the Kirchberg hill but not in the Grand Cru area. It is on the top of the hill (altitude 350 m), close to the forest. 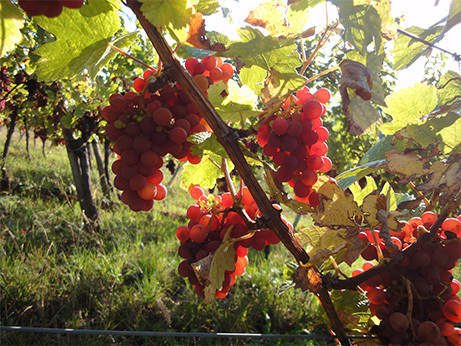 The temperatures are more constant there and in summer the heat is not as strong as in the Grand Cru. So the maturation takes longer and the flavors are more elegant. The wine is dry and fruity. It is made with 50 % of Riesling, 20 % of Pinot Gris, 20 % of Gewurztraminer, 5 % of Muscat and 5 % of Pinot Blanc. All these grapes are planted together in the some field. They grow together with the same weather conditions and they are harvested together.